The World Bank (WB) expects Vietnam’s economic growth this year at nearly 6.8 percent, compared to the 6.3 percent projected for East Asia and the Pacific, in a report released on December 11. This year, the growth of vegetable and fruit exports slowed down significantly, but the target of reaching US$10 billion in revenue in 2025 was still within reach, said the Ministry of Agriculture and Rural Development. The Northern Power Corporation (EVNNPC) is projected to enjoy a 12.14 percent production growth in 2018 with 64.3 billion kWh of electricity, according to a report delivered at the firm’s customers’ meeting in Hanoi on December 11. Since the start of this year, more than 10,000 ha of dragonfruit in the south central coastal province of Binh Thuan has been grown under VietGap standards, an increase of over 500 ha compared to 2017 and accounting for about 30 percent of the province’s dragonfruit growing area. Up to 18 million working days and VND6 trillion (US$258 million) could be cut for businesses when ministries scrap and simplify regulations and examination procedures, a report shows. Google is researching the procedures for opening a representative office in Vietnam to ensure that its compliance with local regulations is in line with its international commitments, Senior Vice President Ken Walker has said. Viet Nam expects South Africa to be a gateway for exported Vietnamese rice to enter other markets in Africa, said Deputy Head of the Ministry of Industry and Trade’s Import-Export Department Tran Quoc Toan, who led the Vietnamese trade promotion team during a two-day visit to South Africa that ended on Monday. The total number of visitors to Hanoi is estimated to hit 26.04 million this year, up 9.3 percent from 2017, as released at a regular press conference of the municipal Party Committee on December 11. The Ministry of Health (MoH) has sent a letter to directors of health departments in different provinces and cities asking them to ensure personal and environmental hygiene and prevent diseases in the typhoon condition. Firms established in the past 11 months of this year registered the employment of 1.1 million workers, which showed a drop of 4.5 percent year-on-year, according to the General Statistics Office (GSO). The Mekong Delta city of Can Tho’s agro-forestry-fishery output for this year is 13.5 trillion VND (578.5 million USD), 4.1 percent higher than the target, according to the municipal Department of Agriculture and Rural Development. Việt Nam was seeking co-operation in developing new payment systems to diversify financial services and meet market demand in the new era of technology, Deputy Prime Minister Vương Đình Huệ said at the meeting with Singapore-based Clermont Group on Tuesday morning. The northern mountainous province of Hoa Binh should bring into play the full potential of its land, people and culture to become a tourism locality, Prime Minister Nguyen Xuan Phuc said in a working session with local officials on December 11. Việt Nam placed 16th in the world among countries with highest number of internet users as the people online account for more than 60 per cent of its population, according to the Ministry of Information and Communications. How are foreign brewers performing in Vietnam? A ceremony to repatriate remains of US servicemen who died during the war in Vietnam was held at Da Nang International Airport on December 11. Chairman of the Ho Chi Minh City People’s Committee Nguyen Thanh Phong expressed wish to acquire the Chinese city of Chengdu’s experience in urban and transportation management during a reception on December 11 for visiting Mayor Luo Qiang. The Department of Agriculture and Rural Development of the southern province of Kien Giang has announced the list of 25 fishing vessels and owners violating the efforts to fight illegal, unreported, and unregulated fishing (IUU) as required by the European Commission. A fake website was found to sell online football tickets for the upcoming second leg of the final match between Vietnam and Malaysia in the AFF Suzuki Cup 2018, according to the Vietnam Football Federation (VFF). The heavy flooding and landslides triggered by torrential rains in central provinces have left at least two people dead. The daring business plans in traditional craft villages have attracted billions of dong worth of capital. Saigon braces for AFF Cup final football frenzy with full mobilization of police forces and stringent traffic restrictions. Although nearly half a century has passed, the American war’s casualties and victims continue to suffer. Vietnam has taken specific actions to fulfill her commitments to promoting and protecting human rights at national, regional and international levels as a responsible member of the international community. Authorities in provinces in the southern part of the country are taking necessary measures to prevent disease in poultry and transmission to humans. Vietnamese and Chinese experts and artists in traditional stage art met at a conference in Hanoi on December 11 to share experience and seek ways to promote the art, as well as optimising the role of theatrical activities in deepening mutual understanding. In the early years of the Vietnam War a cultural revolution was underway on the West Coast of the United States. It wasn’t women’s liberation or the counterculture. It was the Shortboard Revolution. As the modern sport of surfing was taking shape, many of its earliest adopters were being sent to war the jungles of Vietnam. Deputy Prime Minister Vuong Dinh Hue called on Singapore’s Clermont Group to share its experience with and provide consultations for Vietnam in building and developing an ecosystem for fintech and digital banking. 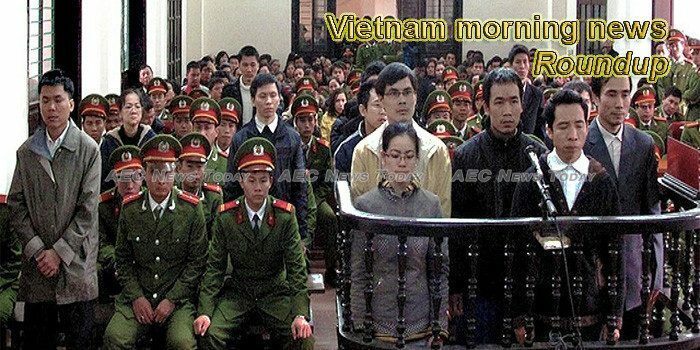 This week’s Vietnam morning news feature photo acknowledges Human Rights Day, December 10.